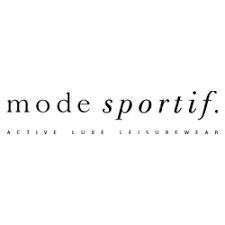 Find here Mode Sportif coupons, vouchers and deals. Founded by Deborah Symond in 2013, Mode Sportif is inspired by a personal desire to posses a wardrobe that seamlessly transitions from the the workout studio to the street, with sartorial style. By combining luxury leisurewear pieces with pared back activewear essentials, Mode Sportif masters the art of the off-duty dress code for the contemporary woman. Delivering the world’s most desirable international brands to both the Australian and international market alike, alongside championed customer service –worldwide shipping to more than 70 countries (including same-day delivery to Sydney and next-day delivery in Brisbane, Melbourne and Adelaide), premium signature packaging, simple returns and exchanges and credible style advice from the inspired team of in–house stylists, Mode Sportif offers the ultimate shopping experience.